Great News! 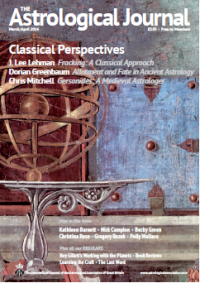 The New Astrology of Towns Cities has received it’s first review from The Astrological Journal – one of Britain’s foremost publications aimed at the UK astrological community, and published by the Astrological Association. In short, this is a fascinating and unique book – a must-have reference that opens a window onto our relationship with the places where we live and work. I confess I looked straight away at the towns and cities where I have lived – as a Gemini with a Sagittarius Descendant, there have been quite a few of them! – and was stunned to see my personal connections to the astrology. And of course I looked too at the places I have always longed to live – an even more interesting and revealing exercise. The book, which is now available in both print and eBook formats, will soon be on sale on the iBooks store.